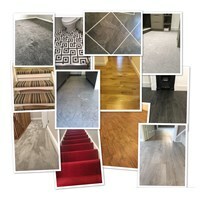 Danny Hahn Flooring - Carpets/Flooring based in Harlow, Essex. Thank you for considering Danny Hahn flooring for your flooring project. We’ve been providing quality flooring installation and repair services to the domestic and commercial sectors for the last 14 years, priding ourselves in creating an outstanding experience for each and every one of our clients. Our experience and knowledge will help you to decide which type of flooring is best for your home, work place, or lifestyle. We offer a “DESIGN/SUPPLY/INSTALL” programme where we bring our MOBILE SHOWROOM to your home / business with colour schemes, a wide range of samples and a wealth of knowledge to ensure floor coverings are suited to not just look and feel good but to serve a purpose. We deal with all the top leading brands right down to a selected few hand picked gems that only we have our hands on, and all at very competitive prices. So whether it’s a top of the range QUICKSTEP laminate, AMTICO vinyl tile, soft luxurious bedroom carpet or a small repair needed in you're real timber floor we really do offer the best of the best in everything we do. WE OFFER FREE ESTIMATES AND SUB-FLOOR INSPECTIONS PRIOR TO ANY INSTALLATIONS. We cover the North London area, Hertfordshire and Essex.